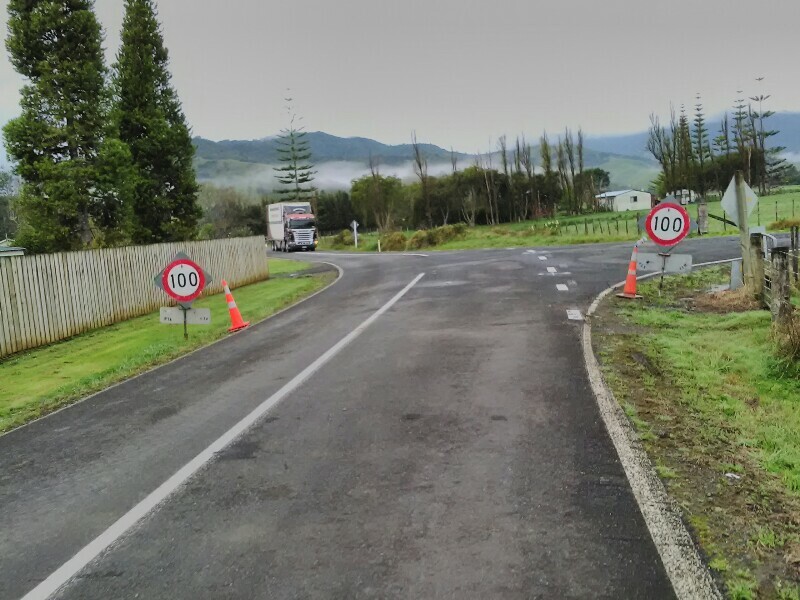 First challenge today: Ford Otenaroa stream. Wading nearly hip deep through cold water. An utterly unpleasant feeling only minutes after crawling out of my cozy sleeping bag. To get warm I'm powering along a gravelled road for two hours that takes me to the Raetea trail head. Time check: 09:15. Trail notes state it would take me 9.5 hours to complete the trail. 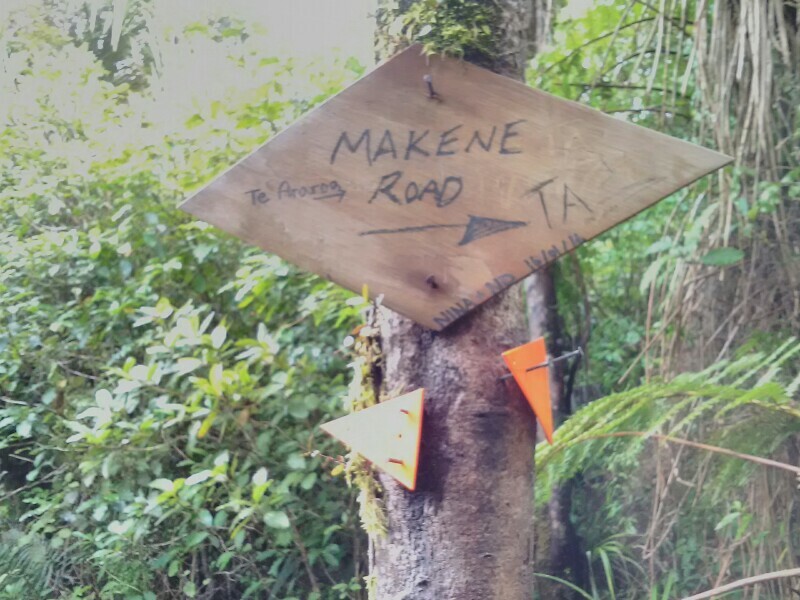 So if everything goes smoothly, I would reach Makene Road, the end of the trail, shortly before sundown. The track is rough, steep and muddy and it seems to take ages to reach 744 meters high Raetea Peak, the highest point of the Northland Forests. It's a continuous up and down with many overgrown parts, making it tricky to find the correct way. Progress is bad, as expected. Many fallen trees on the track are slowing me down even more. Already noon - Makene Road seems to be out of reach. The Lunas are struggling and barefoot walking would be to demanding for my feet in this rough terrain. Today I'm giving the Tabu's a try, a sturdy waterproof sock. With the mud sticking between the sandals and the Luns it's still slippery but not as bad as without them. Another problem I encounter for the first time is that the Velcro of the straps become loose. As they are covered with mud they won't stick anymore. No other way to remove and carry on without them - 2/3 still ahead! Now all the pressure lies on the tiny string between the two biggest toes of each foot. The trail eventually widens a little and increases the progress temporarily. The aching feet, however, prevent me from going too fast. I was sure the trail wouldn't be as comfortable as this all the way through. And sure enough the trail changes again. And what a change it is. Mudageddon might be the right way to call it. Knee deep in the mud - a lot of effort for every step. No fun after being on the move for more than 10 hours. The trail descends steeply. Only thanks to holding on to the trees I make it down without falling. It's 18:30 when the forest spits me out. The view of the rolling hills around, lit by the setting sun is amazing. Hard to imagine that these peaceful looking hills are so hard to hike in. With the sandals in my hand I hurry down towards the road. Concentrating so hard to avoid a misstep, I recognize a dead horse right beside the track only when the stench of death enters my nose. Then finally, after 12 hours of hard work I'm on terra firma again. The farmer, who I meet there is surprised when I tell him about the dead horse up the hill. Now my goals are only get rid of the mud on my legs and pitch up my tent as quickly as possible. With the last light I slip into my sleeping bag. On the one hand very happy that I made it out of the forest, as it would have been a pain to continue in the mud tomorrow morning. On the other hand however also a bit anxious that it has been a bit too much for my feet. Yep, that's where I wanna go!